It’s time to look at another quick video game manga adaption. This one takes a look at the very beginning of one of the games. There are two chapters and when combined they become about as long as the average weekly chapter. It’s another nice preview to a game and really shows you what to expect with Klonoa. The art is good enough where you start to wish that this had been a long running series. Fortunately there is another Klonoa title for that, hopefully it is as solid as this one. The basic plot is that Klonoa is having a good ole time when danger strikes and he goes in to investigate. It turns out that a master villain has shown up and is bent on taking over the world. Klonoa must now stop this guy and show the world why he is a hero. Klonoa isn’t the strongest guy on the block and does get nervous quite a few times in this short manga, but the important thing is that he never gives up. He slowly realizes the gameplay mechanics at play here and then as the series ends he is ready for more action. Klonoa is the kind of lead who can really hold his own adventure. He’s just a fun guy and the art is also on point so he looks like a classic main character. You kind of get a Beyblade or Pokemon Adventures type feel from the artwork. The battle scenes are solid and everything feels like it is taken right from the game. Certainly a good manga adaption to check out if you really want to know what to expect in the game. The minions/suction gameplay gimmicks were definitely pretty enjoyable in the games so it’s nice to see them here. I also like the design of the main villain. He’s the kind of antagonist who lets you know that there will be real stakes here. Overall, Klonoa is a fun one to check out. It’s only about 15-16 pages so you’ll blast through it. I’d also recommend the video game while you’re at it. It’s a solid platforming series with a good plot to accompany the gameplay. It’s just a solid all around package and I can say the same for the manga. It’s always nice to have a bit of supplementary content so the fact that this was released at all is pretty neat. Of course there isn’t much else to say about it. You could probably read the title in the time it takes to read this review. Just know that Klonoa is the kind of hero that you want in your corner. 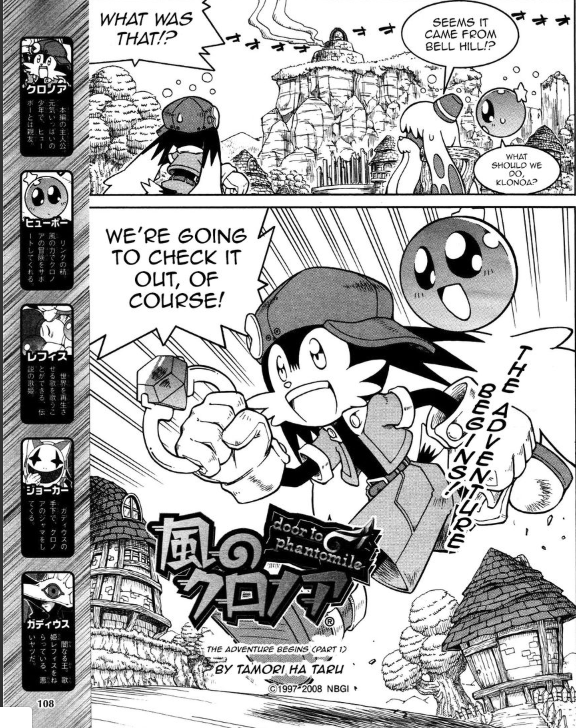 This entry was posted in Manga and tagged Adventure, Kaze no Klonoa, Klonoa, Manga, Manga Review, One-Shot, Review, Video Game Adaption by dreager1. Bookmark the permalink.